TCC is in the process of hiring an architecture firm to design repairs and improvements to buildings on NW Campus, moving closer to the time that campus scaffolding could be removed. The scaffolding has been up for over a year and was set up following storm damage in March 2016 after subsequent building and facade assessments, said vice chancellor for communications and external affairs Reginald Gates. 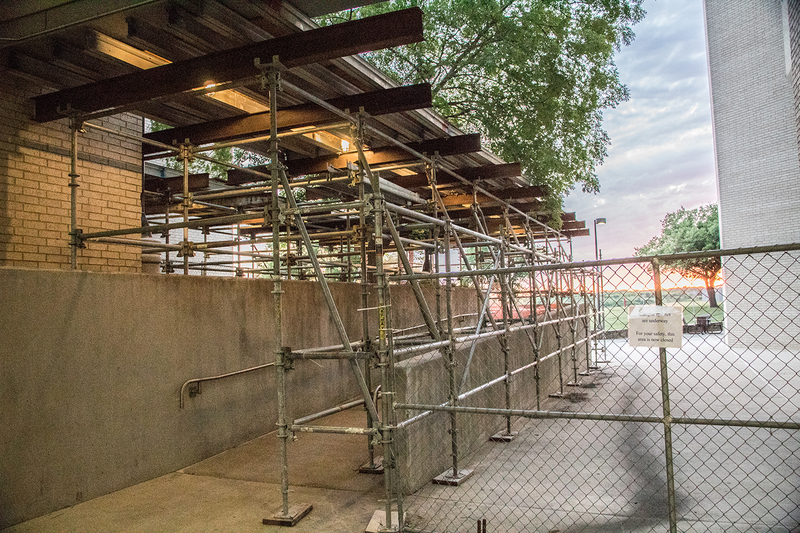 “The scaffolding is to ensure everyone’s safety as repair and renovation work continues on the campus,” Gates said. A request for qualifications was made to engage a design team to work with the college’s real estate and facilities department for the planning and design for repairs and improvements to buildings campuswide, he said. “This work will take time, as the design and ultimately construction will take several years to complete,” Gates said. More than 20 firms have applied and will be interviewed by the district’s real estate and facilities team, said NW Campus president Zarina Blankenbaker. She said she expects a selection to be made during the summer, and then the chosen firm will begin its work. How many buildings will be affected will be determined after the plans and designs are completed, Gates said. “Timelines will be established within the design work,” he said, adding that the cost of the project will also be determined through the work. As for where the money will come from to cover the cost of the work, Gates said TCC’s board of trustees will determine that once the designs are completed. Some students have accepted the presence of the scaffolding and fences while others are eager for them to be taken down. “It’s ugly, and it looks like trash,” NW student Victoria Sandberg said. NW student Nicole Rodriguez, who’s been a student since before the scaffolding went up in spring 2017, said she’ll be happy to see it go. “It’s kind of gotten in the way because the shortcuts you would take you can’t take anymore,” Rodriguez said. NW student Robert Myers also remembers what the campus was like before the scaffolding went up and how people reacted when it did during his second semester. Like many NW students, Zachary Bryan said he doesn’t know why the fences and scaffolding were and still are set up around the campus. Valerie Gameson, a first-semester NW student, didn’t know why it was up either, but one of her instructors told her about the storm that damaged the campus. She said the scaffolding makes her nervous to walk around. “I kind of try and stay away from it honestly, but there’s some areas that you can’t,” Gameson said.